Around the LIFE-SAVE project an articulate partnership has been added, which can give this ambitious project the tools and the resources to get to industrialization and commercialization in a short time. 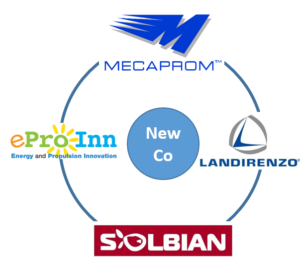 The partnership, which also took the form of joint participation in the HySolarKit project under the SME Instrument measure of the European Horizon 2020 program (where the proposal obtained the “Seal of Excellence”), is made up of consolidated companies (Landi Renzo, Mecaprom), start-up companies (eProInn and Solbian), and established consulting companies (CiaoTech), with an external participation of Maltese government agencies (Transport Malta). eProInn s.r.l. (Energy and Propulsion Innovation) is a spin-off company of the University of Salerno, founded in 2014 by a group of researchers working at eProLab (Energy and Propulsion Laboratory) in the Department of Industrial Engineering of the University of Salerno and has developed a first hybrid-solar vehicle prototype, converting a FIAT Punto. Landi Renzo, leader in the automotive after-market conversion sector with LPG and CNG plants, has carried out a hybrid vehicle retrofit project (HERS – Hybrid Electric Retrofit System) similar to HySolarKit, and characterized by innovative solutions in terms of integration of the electric wheels with the rear brake disc. The integration of the two projects, together with the participation of Solbian, a leader in the sector of high performance flexible panels, and of Mecaprom, a leading company in the field of conventional and alternative propulsion, allows to emphasize and enhance its respective strengths synergistically. A specific and strategic objective of the LIFE-SAVE project is the creation of a new corporate entity, able to favor and catalyze the industrialization of the project, being able to confer the operational, economic and financial soundness necessary to attract and manage public and private funding. , ensuring the necessary contributions in terms of co-financing.